Live television director Allan A. Buckhantz died on October 10 in Los Angeles. Born on January 3, 1923, he was 88. Buckhantz was one of the regular directors of Matinee Theater, producer Albert McCleery’s lamentably forgotten 1955 effort to bring anthology drama to daytime television. The NBC series presented a live hour-long play, in color, five days a week. Buckhantz remained among the regular rotation of Matinee Theater directors for the entirety of the series’ three-season run, directing a total of over eighty segments. Matinee Theater exists mainly as a memory today. UCLA has a couple dozen of the roughly 150 episodes, none of them directed by Buckhantz. We have to conjure them in the imagination, drawing from the names of the writers and actors associated with them. Buckhantz’s Matinee Theaters included Henry Misrock’s “Beyond a Reasonable Doubt” (his first), with DeForest Kelley and Cara Williams; “Jigsaw,” with Tom Laughlin and a twenty-four year-old Angie Dickinson (who went on to star in several more Buckhantz segments); Sumner Locke Elliott’s “Friday the 13th,” with Paul Burke in a small role; “The House of the Seven Gables,” with John Carradine; a version of William L. Stuart’s novel “Night Cry,” which Otto Preminger filmed as Where the Sidewalk Ends; a remake of Alvin Sapinsley’s “One Mummy Too Many,” originally directed by Sidney Lumet for The Alcoa Hour, with Nita Talbot; “Something Stolen, Something Blue,” with Jack Larson, Dolores Hart, and Frances Farmer; Theodore Apstein’s “The Quiet Street,” with Rip Torn and Suzanne Pleshette; and “Dr. Jekyll and Mr. Hyde,” which McCleery had deemed unproducible on live television until Buckhantz suggested the character experience an “organic” rather than a physical transformation. Those sound rather like they would have been worth preserving. At CBS on the Coast, we didn’t do a show a day. We didn’t do a show a week. We did five, six seven shows a day. Rehearsal was a luxury. I was doing news, Peter Potter’s Jukebox Jury, commercials, and whatever else needed to be done. I probably did the first band show ever to hit television – a local show, out of the Palladium. The orchestra would sit on the stage while I made notes on when the trumpets came up. Then I’d add whatever I could do to make it look more staged . . . .
After we finished Peter Potter’s Jukebox Jury at midnight on Saturday night, we’d stay an hour, setting the lights for a live religious show Sunday mornings on KNXT. There were four or five staff directors who alternated. Everybody hated directing it, because the various religious groups were always changing things. About half of the Matinee Theater directors transitioned into filmed television and went on to substantive careers as episodic directors – Walter Grauman, Boris Sagal, Lamont Johnson, Arthur Hiller, Sherman Marks, Lawrence Schwab. The rest were never heard from again – Jim Jordan, Irving Lambrecht, Livia Granito, Alan Cooke, Alan Hanson, Pace Woods. Buckhantz, alas, fell largely into the latter category. His only other television credits of note were a single Kraft Television Theatre and two episodes of The Dakotas, a good 1963 revisionist western produced by Anthony Spinner, who had been a Matinee Theater story editor. Immediately after Matinee Theater, Buckhantz produced and directed a disastrous Broadway production, Happy Town, from which (as reported in Dorothy Kilgallen’s column) Buckhantz was ousted following a “bitter feud” with the cast and crew. The show closed after four days in October 1959. The peripatetic Buckhantz moved to Germany and worked there as a television producer and director during the sixties. 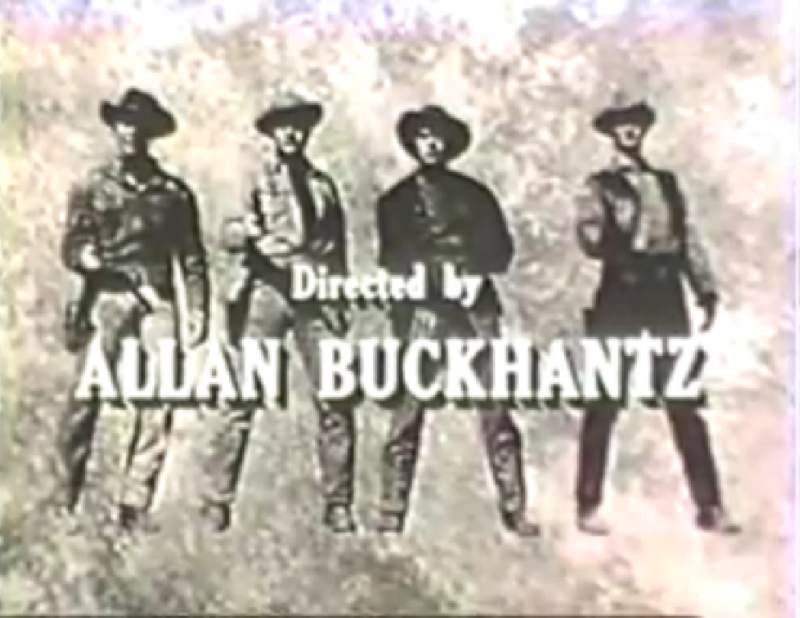 Buckhantz resurfaced in the United States as the executive producer of a 1969 television adaptation of Hans Brinker, with Eleanor Parker and Richard Basehart, and as the director of an action movie, Portrait of a Hitman (starring Jack Palance and Rod Steiger) that sat on the shelf for years. Updated on January 6, 2014, to add the dates of Buckhantz’s birth and death.